EA Sports MMA is a fighting video game which was developed by EA Tiburon and published by EA Sports from 2008 to 2010. It was released for the PlayStation 3 and Xbox 360 on October 19, 2010 in North America and October 22, 2010 everywhere else. Online services have been shut down since April 13, 2012 for the PlayStation 3 and Xbox 360. On June 1, 2009, Electronic Arts announced that an all-new fighting title is in development under the EA Sports brand. EA Sports MMA was released in 2010 on the Xbox 360 and PS3. Its website did not reveal any facts about the gameplay or its release date, just one link to sign up for the EA Sports newsletter and another that directs people to EA Sports' MMA forum. However, the Facebook page for the game released steady numbers of videos and amounts of preview information leading up to the release. This game has many options to create the ultimate MMA experience. The game focuses on global MMA, not restricting its gameplay to one brand or region. It was announced that the first trailer would be shown on CBS, during Strikeforce: Fedor vs. Rogers on November 7, 2009. The trailer featured Emelianenko and Rogers performing a variety of attacks and defenses against each other. The trailer ended with both of the men about to punch each other in the face. It was announced that EA MMA would feature Strikeforce as its flagship promotion. 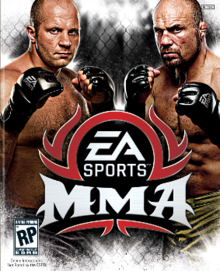 The US cover for the game shows Fedor Emelianenko and Randy Couture, while the Japanese cover has Hidehiko Yoshida instead of Couture. Players can move, and strike at enemies. They can turn attacks into body punches, kicks or feints. Takedown/transition attempts and takedown/transition defense can be performed. Depending on the timing, successful defense can result in a sprawl, transitional block or a reversal. Submissions can be attempted, and the defending player can prevent the hold from being applied if he reacts quickly enough. Otherwise, the fighters engage in one of two submission mini-games. Once a submission has been initiated, it is not possible to cancel out of it. For arm and leg submissions, the players must tap either the submit or defend button several times until the defending fighter either submits or escapes. The idea is to tap the button in short bursts while maintaining the stamina at optimum levels and never letting it drain completely. For chokes, a circular image appears in the center of the screen. A colored marker moves along the circumference from clockwise to counterclockwise in unpredictable patterns and fades in and out of view. The player (whether on offense or defense) must track and match the movement of the marker with the left analog stick. The circle shrinks (while the screen fades to black) as the fighter gets closer to getting choked out and expands when one gets closer to escaping. The game is set in venues include boxing rings, circular cages and hexagonal cages, and it includes multiple rule sets including Japanese, Vale Tudo, and Strikeforce rules in addition to standard Unified Rules. The game includes the ability to fight southpaw- or orthodox, execute foot stomps, soccer kicks and knees to the face on the ground, and fight on the cage, with clinchwork and countering. Mauro Ranallo and Frank Shamrock provide commentary, but are unable to announce most custom names. The game also featured 'Live Broadcasts' that could be viewed from PC or consoles. The player is able to upload hype videos, which will help to increase popularity. EA Sports would choose the fighters based on their Hype videos and schedule fight cards just like in real life MMA. Real life prizes were given out, to a certain level. The soundtrack features around 30 hip/hop and rock/metal songs from various artists through the EA Trax feature. UFC president Dana White declared himself "at war" with EA over the development of the EA Sports MMA video game. According to White, the UFC had hoped that EA Sports would pick up the publishing rights to the UFC's video game license, but EA Sports declined. White remarks, "EA Sports told us, 'You're not a real sport. We wouldn't touch this thing. We want nothing to do with this.'" The UFC instead partnered with THQ to develop UFC 2009 Undisputed. "We put our asses on the line, THQ and the UFC, to make a video-game deal in the worst economy in the world," White told reporters in July 2009. "We go out there and do this thing, and it's successful, and now EA Sports wants to do a video game. In response to these allegations, EA Sports have since claimed that Dana White held a meeting with EA in Los Angeles, who are responsible for successful sports games. Additionally, the fact that EA Sports began development of EA Sports MMA before UFC 2009 Undisputed was initially released led credence to the notion that the development of EA Sports MMA was not reactionary. White warned the fighters who intend to be included in the upcoming EA Sports MMA game release, claiming that "If you do business with EA, you won't be in the UFC". Former UFC heavyweight champions Tim Sylvia and Andrei Arlovski, as well as Frank Trigg and Vladimir Matyushenko confirmed their presence in the EA Sports MMA video game. Fan favorite Randy Couture was under contract with UFC before agreeing to be a part of EA Sports MMA, but was able to take part in the game due to never signing over his likeness to the UFC for use in video games. White has since changed his standpoint on this subject. EA Sports MMA launched on October 19, 2010, with a public launch party for fans and media. At the gatherings, UFC Hall of Fame fighter Randy Couture and former Pride champion Fedor Emelianenko, both of whom grace the cover of the game, finally got the opportunity to fight each other, albeit via their video gamer personas. Fedor went on to win via TKO in the game. Initial reviews have been positive with Metacritic giving the Xbox 360 version a score of 79% after 55 reviews (78% after 42 reviews for the PS3 version) and Game Rankings giving the Xbox360 version a score of 80.5% after 39 reviews (78.2% after 25 reviews for the PS3 Version). While EA Sports MMA remains a critical success thus far, it hasn't had the same success financially. According to a Cowen & Company analyst, sales of EA Sports MMA have been poor, with analyst Doug Creutz saying it’s “more or less dead on arrival at retail". On October 21, 2010 EA Sports MMA was released as for the iOS platform. It is a scaled-down version of the game, featuring 24 fighters from five different weight class, create-a-fighter mode and career mode. On June 4, 2012, Dana White, along with THQ, announced that the UFC game license had been transferred to EA Sports, who produced the next cross-platform UFC game. On June 17, 2014, EA Sports UFC was released as a spiritual successor to both EA Sports MMA and UFC Undisputed 3. ^ James Orry. "EA to alternate between Fight Night and MMA". VideoGamer.Com. Retrieved 12 June 2015. ^ Michael McWhertor. "EA Sports Brings MMA To Your iPhone". Kotaku. Gawker Media. Retrieved 12 June 2015. ^ Stewart, Kemuel (2008-06-01). "E3 '09: EA Sports MMA Announced". GamerCenterOnline. Archived from the original on 2009-06-15. Retrieved 2008-06-01. ^ "EA SPORTS MMA". Ea.com. Retrieved 12 June 2015. ^ "Service Updates". Ea.com. Retrieved 12 June 2015. ^ "EA Forums". Forum.ea.com. Retrieved 12 June 2015. ^ "Gofighter.com". Gofighter.com. Archived from the original on 28 January 2016. Retrieved 12 June 2015. ^ "E3 2010: Hype Yourself in EA Sports MMA". IGN. Retrieved 12 June 2015. ^ Morgan, John (July 12, 2009). "UFC president Dana White says EA Sports responsible for current MMA video game war". MMAJunkie.com. Retrieved January 6, 2017. 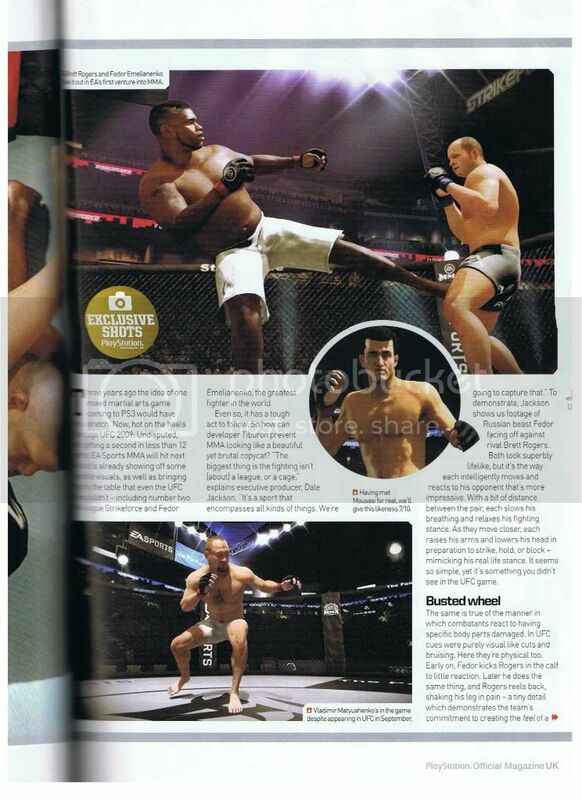 ^ " "Gamasutra - Moore: EA Sports MMA Targeting Fighters' Image Rights". Gamasutra.com. Retrieved 12 June 2015. ^ "EA Sports to release MMA-themed videogame, "EA SPORTS MMA," in 2010". Archived from the original on February 9, 2010. Retrieved June 20, 2010. ^ "Exclusive Shots" (JPG). I872.photobucket.com. Retrieved 2015-06-12. ^ "Finally, Fedor vs. Couture... Well, Sort Of". MMAWeekly.com. 2010-10-19. Retrieved 2010-11-05. ^ "EA Sports MMA". Metacritic. Retrieved 12 June 2015. ^ "EA Sports MMA". Gamerankings.com. Retrieved 12 June 2015. ^ "EA Sports MMA Sales Initially Poor [Analyst Calls EA's MMA Game "Dead On Arrival", Is There Room For A Non-UFC MMA Video Game?]". Archived from the original on July 27, 2011. Retrieved December 22, 2010. ^ "EA Sports MMA Now Available for iPhone". Pastapadre.com. Retrieved 12 June 2015. ^ "EA SPORTS MMA for iPhone". Ea.com. Retrieved 12 June 2015. This page was last edited on 4 April 2019, at 06:45 (UTC).